A little work now results in having a healthier lawn and garden come spring. 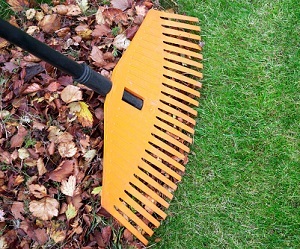 Most people only believe that raking leaves and minimal yard care is acceptable in fall. However, in order to ensure the plants will be strong enough to survive, here are the steps you need to take to ready the lawn and garden for winter. Aerating a lawn should be done before the colder temperatures start to come in. What this does is help air, water, and nutrients penetrate to the grass roots to guarantee the roots will grow stronger and deeper come spring time. Either we can provide the service or you can spike down 4 inches into the soil. Pulling any type of weeds on the lawn or flower beds is critical to help your other plants survive. The best time to remove weeds is after rain or you can simply water the area down. By doing this the whole root can be removed easily by hand or garden tool. Another way to remove weeds is by using chemical products that must be sprayed directly on the weed or you risk killing other plants. Seeding and fertilizing your lawn in the fall (September-November) is perfect after months of being exposed to high temperatures. Grass roots keep growing until the ground gets around to 40 degrees. One of the most important steps is to mow the lawn and keep the grass at 1 ½- 2 inches. If the grass is longer it has a high chance of matting and the greater possibility of winter lawn disease (snow mold). Another plus is our next step, raking, will be much easier since the leaves have nothing to grasp onto. Raking is a time-consuming task but it prevents the dangers of snow mold diseases and inhibiting grass growth come spring time. Collecting leaves can be beneficial for your lawn, flower beds, or shrub borders in the spring time because they make an excellent fertilizer. Simply store them into a compost bin and flip every now and then to unearth rich, compostable organic soil. After a hard frost perennials should be cut close to the ground. During the colder months this will send energy to the roots and they will be ready for the next season. Word to the wise: be careful not to cut flower buds from shrubs that bloom in the spring. By doing so it will reduce the flowering in the spring. Also, remove slugs or snails that feed on the plants because they start to breed in the fall. All the plants being cut can be included into a compost pile. Lastly, it is important to winterize any outside faucets or drop systems after giving plants a deep watering. Freeze damage can destroy the faucets or lead to a pipe burst that will lead to a hefty repair bill. These are a few of the important steps for fall and winter lawn care. If you want top-quality care or you are in need of help, you should contact Greener Horizon. As experts in landscaping and maintenance, we will guarantee that your lawn will be in pristine condition for the fall months and prepped for the harsh winter to come.